Are you going on a cruise or an all-inclusive vacation this summer? You need to read this post! I am on the trip of a lifetime, a cruise in Alaska. This adventure has been unbelievable, and between the ship and the wildlife, we have had such fun. We've learned so much about Alaskan culture, terrain and history. Before embarking on this journey, I was so afraid of what the "cruise vacation mode" would do to my health goals. I feared that I would use vacation as excuse to let my health fall by the wayside. The scary thing about cruises is that there is food literally at every turn. It shows up in your room, on every buffet table on every floor. They serve breakfast from 6:30-10am, coffee and muffins from 10-11:30, Lunch from 11:30-2pm, tea time at 3:30, appetizers and cocktails at 5:00, dinner from 6-10pm. Literally ALL DAY LONG. It can be a scary place. 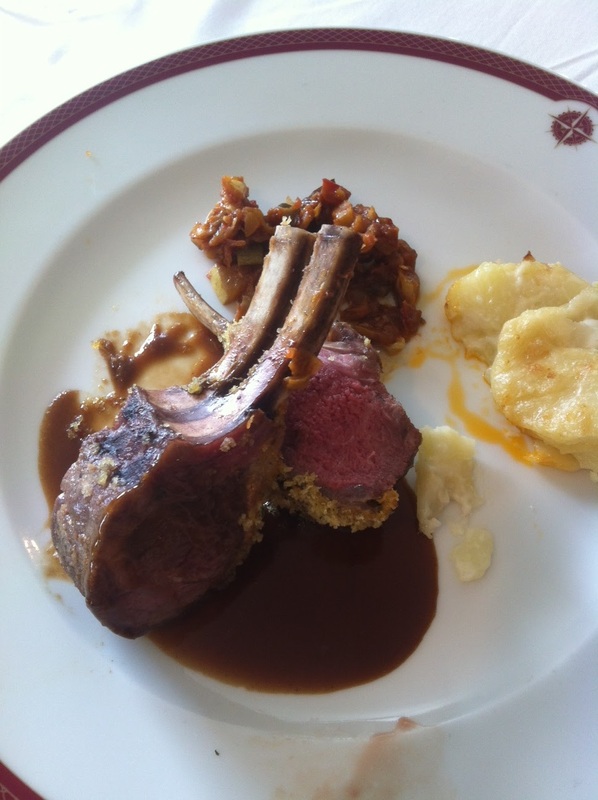 This blog post is my testament, my chronicle that you can eat paleo on a cruise. In fact, it has been so easy! Before the cruise, I outlined my "rules" that I would follow. It is always smart to have a plan. I will not go back for buffet seconds. I will focus on simple proteins and dark green vegetables. I will not order dessert. I will not drink more than one glass of wine in a night. I will not eat after dinner. I will be very picky. I will not justify my food choices because there is nothing I can eat on Paleo.. there will be options, even if they're boring. I will listen to my body's hunger signals. I will not stuff myself like a Thanksgiving turkey. I will eat breakfast every day. 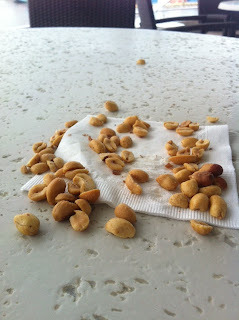 I will not mindlessly eat nuts at the bar. 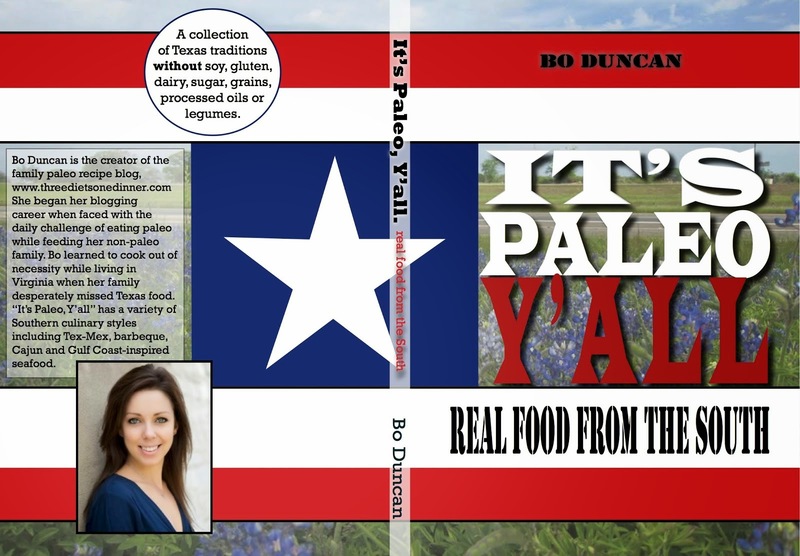 I will treat everything that goes in my mouth as a deliberate choice -- an informed decision to fuel my body. Find the dark berries.. even if they're meant to be decoration. The best options for breakfast is always the omelet station. You are the boss here, dictating everything that does and does not go into your breakfast. Just don't even look at the muffins. There are tons and you will be tempted. You are better than those gluten/sugar-bombs. Look away! Drink black coffee and herbal tea. 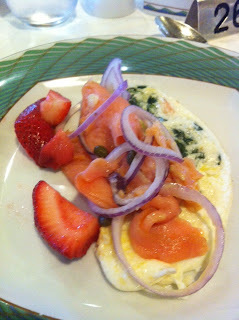 My custom omelet, smoked salmon and herring. Caviar for breakfast!? Yes please. Avoided that cracker. More salmon and eggs, black coffee. Bone Broth! 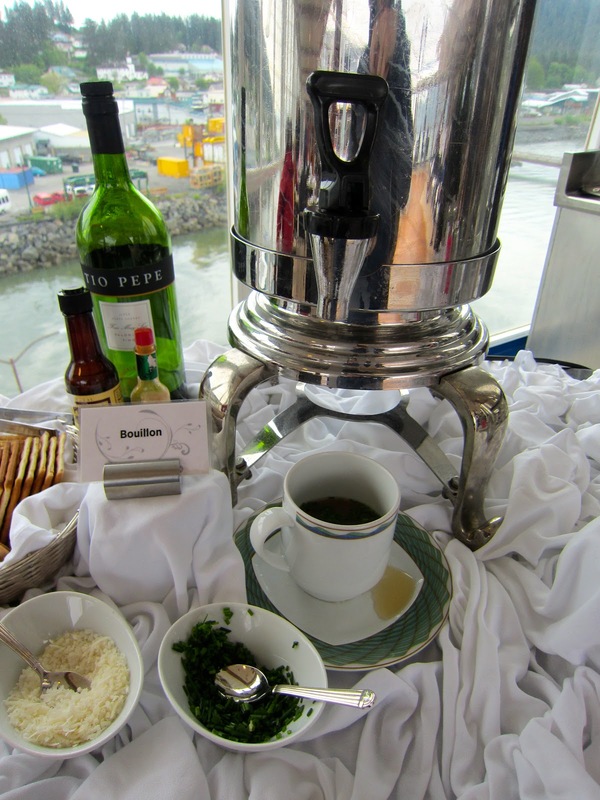 What luck I had when I discovered that they had bouillon/bone broth on tap on this cruise! It is a great option for keeping your tummy full between meals. Leftovers. See below for my tricks on how to keep them fresh. Eat the toppings, leave the rest for the seagulls. Canapes: Most of the passed apps are served on crackers and toast. Just eat the toppings and discard the rest. 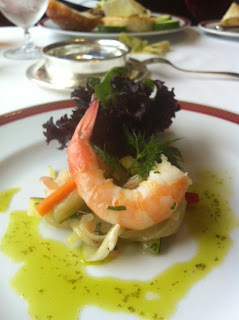 I've had delicious options like tuna tartare, caviar on hard-boiled eggs, shrimp, beef, etc. Ate all the good nuts and left the legumes. Alaskan smoked salmon is always in the buffet line. Yum! Chicken Cacciatore, cabbage salad and oysters! Be careful! Try not to over fill your plate with a hundred different options. Stick to simple proteins, good fats and leafy greens. I know you'll want to try it all, but stick to 3-4 different items on one plate. Chances are, you'll see all these options tomorrow, too (or even at your next meal). Do not go back for seconds. You'll have plenty more opportunities to eat today. 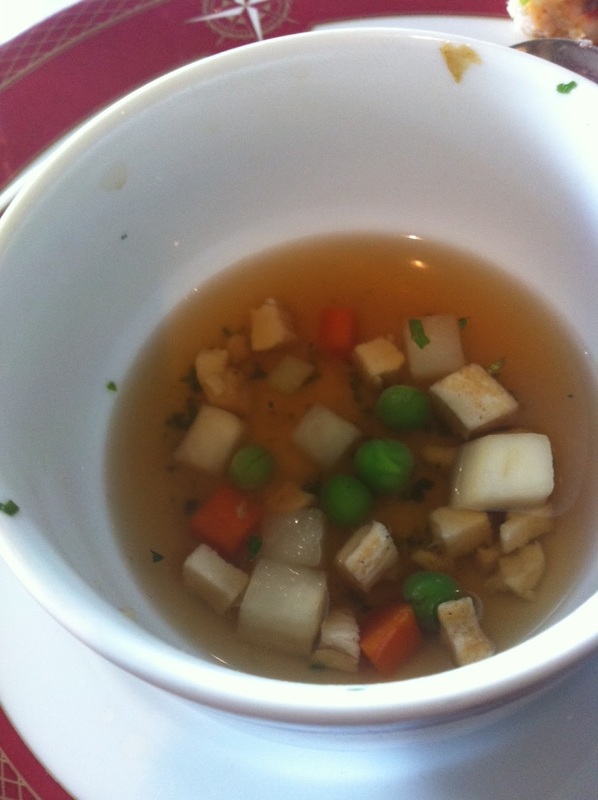 Bone broth based soups are a great start. There are tons of options. Just as you would at a regular restaurant, ask the waiter for a simple protein, veggies and nothing breaded. Speaking of bread, ask your waiter to just remove your bread basket from the table. That is, if your travelling companions are cool with it. After dinner, get up! Don't order dessert! Instead, hit up some live music, some herbal tea in the lounge, or the casino! Okay, if you must, order berries and whipped cream and decaf coffee. Chances are, your family has already dove face first into their molten chocolate lava cake. If you can't beat em, join em, in your own paleoish way. Scraped the breading off the lamb chops-- yum yum. King crab/Filet Mignon surf and turf! Make trailmix with the breakfast buffet's oatmeal toppings. Add salt and cinnamon! Stock up on these cold cuts for later snacking. Get rid of it! If you arrive in your room to muffins and chocolate pillow mints, grab them and take them to the nearest trash can. Hell, throw them off your balcony. It is downright liberating to take that control over the crap they want to feed you! Sleep in! Take advantage of your vacay—catch up on some sleep and you’ll also be narrowing the eating window during which you will otherwise stuff your face. Meditate. Out at sea is a wonderful place to escape from your thoughts, unwind and just be. Find a quiet place to zen out for a while. Drink herbal tea. This is a great trick that keeps your oral fixation in check and can sometimes trick your hunger into settling down between meals. 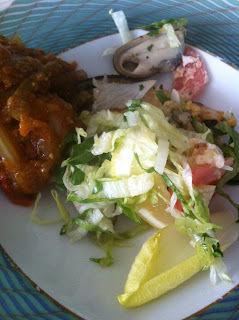 All this instruction on how to eat paleo on a cruise, you are probably wondering if I actually did. Well, for the most part. I stretched my liver to the limit with the all-inclusive alcohol. That led to a couple of poor choices, namely a few bites of dessert and an entire box of movie popcorn (that still hurts). But, we did a great job eating on the cruise. I am proud of my choices and will face my next vacation with no fear! 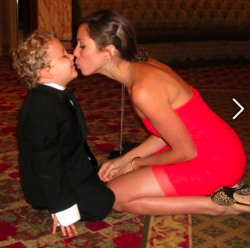 Hi Brittanie, You did a great job on this cruise post! Good pictures and great tips for avoiding the bad stuff. 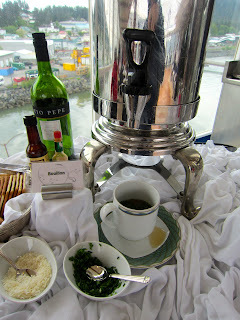 I just wrote a similar blog about our cruise in early May but it's not nearly as good as yours! :) We didn't have quite as much food available as you did, and we certainly didn't have wine included! Would love to have gone to Alaska, but we were afraid it'd be too cold that early. I'm sending your post to my brother who works for Carnival and goes cruising a lot (and is trying to eat primally too).